Another day in the studio - bliss. The local sports centre is running fun days for primary school children, so the eldest monster is going there whilst the younger two are at nursery during the holidays. The middle one just can't get the idea of holidays - why is Daddy still working if it's the holidays and more to the point, why am I at nursery? Without monsters at home, I was able to concentrate on sorting the imagery for my digital prints. They are going to be added to knitted and felted pieces of similar imagery - once the wool has arrived. Apparently there was a number missing from the address so it hasn't arrived yet. Hopefully it will arrive tomorrow as I have run out part way through a piece, so couldn't get on with other knitting stuff today. Instead I got my images sorted. 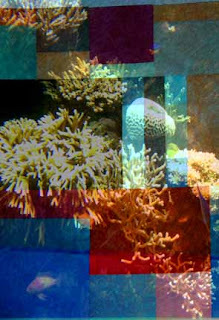 The base photos are from my aquarium series. I've then projected them onto fabric and manipulated the images. I've also had to guess the final size of the knitted pieces as I've run out of time to wait until they are finished before ordering the prints. I tried scientific calculations and ratios, but really it is a matter of fingers crossed and waiting and seeing. I've just got to remain confident about it working! This week I have been able to spend three days in the studio - a huge treat. I am still pondering how to display my pieces at Aberfoyle, but to make sure I make the deadline, I have started knitting today on the first large piece. However the work is shown, I know they will need to be big to be seen there - the trees are just so tall. The sun has shone for some of the week too so I was able to make the July Journal Quilt for Popular Patchwork. It required sun printing and it rained all last week, so it is a bit later than I intended. I don't understand how sun printing works as it seems to bleach the colour out of the covered areas, rather than those exposed to the sun - a bit of reverse logic to me. However, I was happy with the results. 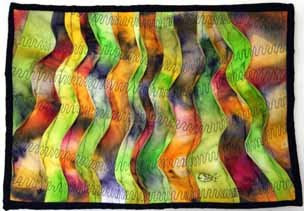 As the pieces of fabric I created were not fabulous designs, I cut them into strips to create uneven pleats; the idea being it would be like waves in the fish tanks. I am pleased with the fabric and also with the pleats - something to mentally file away in case it could be suitable for a larger piece in the future. I took my knitted and felted sample up to Aberfoyle on Sunday to see how the colours went with the trees. In order to be able to photograph it, I put it up against a tree trunk and it stuck. Now I've got a bit of a dilemma. I was intending to have these as free hanging pieces, in between the trees, but I now also like how it would look if they were wrapped around them instead. Not sure what to do. If they are hanging, they will have to be incredibly long to have any impact, at least 4m. But I am slightly concerned about the health and safety impact of this - if there is a strong wind, they will flap about and potentially hit someone - which would not be pleasant! If they are on the trees, I wouldn't have to worry about this, but then I have the issue of how to attach them to the trees without damaging them and I'm not sure if wanted to make tree scarves! At least I am pleased with the colours as the aim was to blend them in with the trees, rather than standing out from them. So I have been a bit quiet recently. It doesn't mean I haven't been busy! As well as the Loch Lomond Show pieces, I have been working hard on a new mystery quilt for Popular Patchwork. I have now finished the quilt top and I am really pleased that it is actually square, with no fudging required. Yes, it is meant to be square! Frustratingly, I can't show it to you as it is meant to be a mystery. I am delaying quilting as I have this fear of spoiling it with poor quilting, but I really need to get it under way as I have just six weeks in which to finish it. This may sound a long time, but I also have to deliver new work for two exhibitions at the same time, do all the subbing on Popular Patchwork and the Scottish school holidays start in 8 days time. So life is somewhat busy. Part of the reason for the rush now is that we have just had a glorious two week holiday in Greece. A good friend was getting married there, which was a great excuse for a holiday. It was incredibly relaxing and I actually enjoyed doing very little apart from play in the sea and on the beach and eat good food. I only finished one book, which is a record for me on holiday. Normally I would read 4 or 5 in a fortnight. We all enjoyed visiting Mycenae and I could have spent hours more in the museum there looking at the figurines and other things found at the site. They are over 3,000 years old, but they are still fascinating. I've been thinking about them for a while and how to use them as the starting point for a project. 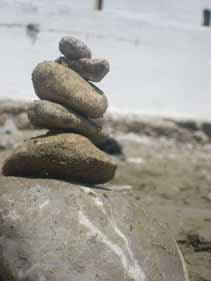 Anyway, the only arty thing I did on the holiday was build stone piles. Much more fun than sandcastles! Back to normal life, today I made some more samples for the exhibition work. They are in the washing machine now, so photos soon.